A fourth place finish in the first race, fifth place in the second race and a storming drive from a tenth position start to fourth place at the chequered flag in the third and final race of the weekend at Brands Hatch in Kent kept Jazeman in the championship hunt of the 2011 Cooper Tires Formula 3 International Series after four events. The first race, on Saturday afternoon, was not only a battle against a field of quick drivers, but one which featured ever-changing weather conditions. The race started on a wet track, after a sudden shower just before the cars went to the grid, with all the teams opting to start on wet tyres. Jazeman, one of the six drivers racing with the championship-winning Carlin team, maintained position in the first half of the race and then, along with the majority of the drivers, opted to pit for slick tyres when the track dried. He dropped to seventh after his stop, but then fought back with a series of blistering laps to cross the line in fourth place. The second race of the weekend, held this morning in dry conditions, featured a semi-reverse grid format, which put PETRONAS-backed Jazeman in seventh position on the grid. Jazeman was off the line cleanly and into sixth position, but a start line shunt behind brought out the safety car, so the field was forced to tour the Brands Hatch circuit until being released five laps later when the stricken cars had been cleared, but having used up half the time available for racing, it left few laps for Jazeman to improve on his start position. At the restart Jazeman made an excellent move on Carlin team-mate and championship leader, Felipe Nasr, flying past the Brazilian to claim fifth place. 18-year-old Jazeman rounded off his weekend with a hard-charging drive, starting from tenth place on the grid. 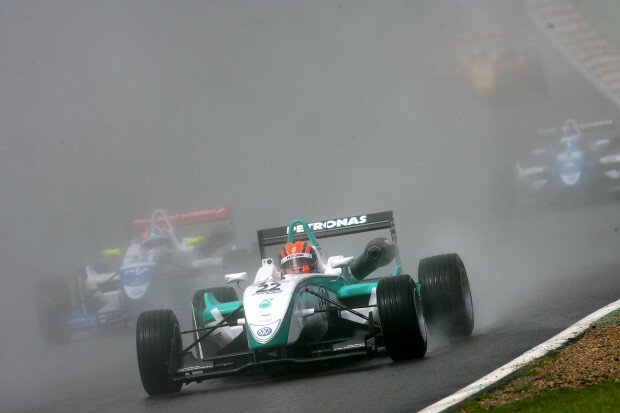 A torrential shower just prior to the start meant that the field had to start with wet tyres and Jazeman once again showed his prowess in the wet conditions, moving up to eighth spot by the end of lap one. The talented Malaysian driver was up to sixth by half distance, and closing down William Buller ahead, posting some of the quickest laps of the race. A clash for second placed Rupert Svendsen-Cook and third place driver Pietro Fantin in the closing stages of the race promoted Jazeman to a well-deserved fourth place finish. The fifth of ten events in the British F3 International Series takes place at the German Formula One circuit, Nurburging, in two week’s time, 2nd – 3rd July.